If you can never find a store-bought planner to suit your needs, a bullet journal might be for you. It's a customisable notebook you create yourself, which gives you the freedom to develop a system of planning specifically tailored to the way you think, plan, and work. A bullet journal not only helps organise your day-to-day life including tasks, lists, and duties, it enables you to create a system that's personalised and unique to your workflow. The fluid, adaptable nature of a bullet journal means you can adapt the planner day to day, month to month - whenever you need to. If your planner system isn't working, you can change it immediately, which can't be said for rigid shop-bought diaries. Why Use A Bullet Journal? There are plenty of apps and digital calendars that can manage your to-lists, appointments, and tasks. A bullet journal is an analogue system that takes a little time to set up - so why bother creating one? If you're a visual person, the act of writing down tasks and striking things off a list might be quite a significant part of your workflow. If you're juggling a lot of ideas, projects, work commitments and social life; having a visual representation of your day, month, and year on paper may be hugely beneficial to your productivity. 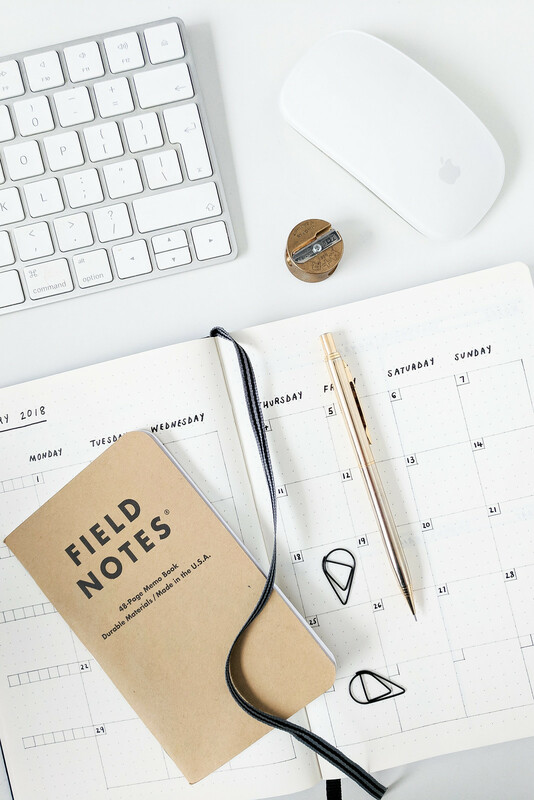 Rather than you having to work around the limitations of a pre-made planner, using a bullet journal means you'll create a system that molds to your needs and creates a more efficient workflow. The original bullet journal system uses rapid logging and note-taking, and combines them with signifiers to create a system for quickly taking notes and striking off tasks. What was intended to be a basic list-keeping system has expanded into a beautifully creative (if time-consuming!) pastime for many. This method of creating a bullet journal sticks to it's minimalist roots; you can make your planner as decorative as you like but the real beauty of this method is its simplicity and adaptability. Identifying your system and getting the key components right is the most important part of any bullet journal. It's easier to create a bullet journal if you choose a dotted or grid notebook rather than plain or lined but any notebook has the potential to work. My recommendation is a Leuchtturm1917 A5 dotted notebook; they are slightly pricier than the average notebook but it has a hard cover, quality paper, and thread-bound spine so it opens flat, which are all the makings of a dream planner. If you have plenty of spare notebooks lying around make use of them, either turn them into bullet journal or use them to test your layouts. A bullet journal can have a dedicated purpose or be a catch-all for everything from work to chores to personal commitments. Knowing what you need your journal for and how you're going to be using it is crucial to developing a system that works. Throwing everything into it can create be overwhelming, you might find it's better to create separate planners for different areas of your life. Figure out what the main purpose of your bullet journal is going to be, what you need use it for, and consider how previous planners have failed you. Use this to determine what your bullet journal's purpose will be and then you can start building page layouts around the information it needs to keep track of. Seen a planner you like the look of? Found a layout that might work for you? Take notes! A great way of creating a bullet journal (especially if you're new to them) is to build your layout around a previous planner you've used or one you think might work, and then tweak it to your specifications. Identify the types of pages you like and may need such as a day, week, month, and year view, with extra pages for note taking and list making. Work on a few ideas, create drafts, and test out a few rough layout ideas in spare notebooks or on scrap paper. Identify any sticking points, make notes, and tweak the layout until you find something you like the look of and will help you plan effectively. You don't need to plan or create layouts for the entire year; the beauty of a bullet journal is it's flexible, you can adapt the planner to suit your needs, and finely tune the page layouts. Unlike pre-made planners, you're not stuck with a set template and are free to change things up from month to month. 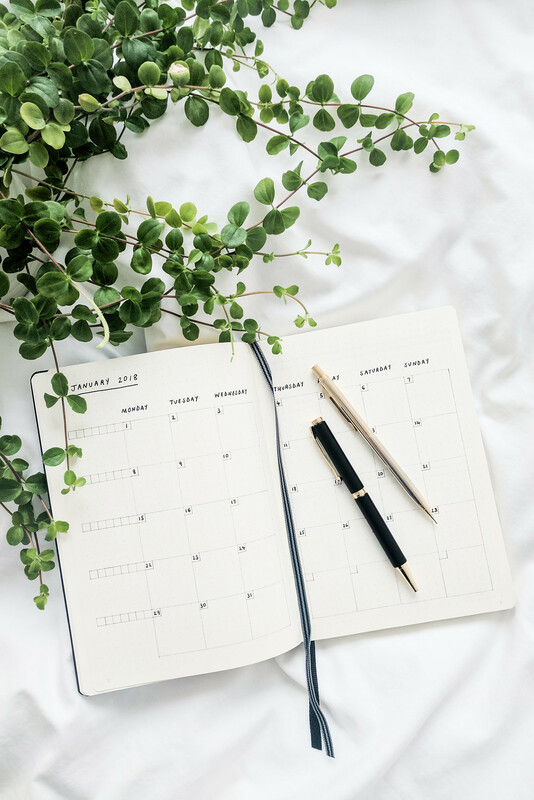 You can keep things super simple with a list-based planner (which is exactly what the original bullet journal was) or create a more elaborate layout. 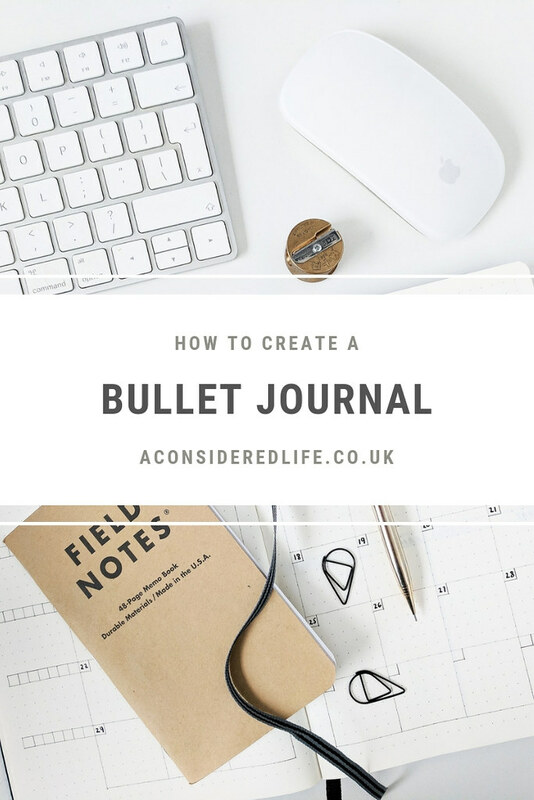 When adopting the bullet journal method of planning there is a learning curve that requires picking up a few new habits and methods of working. Take a look at the original bullet journal key and signifiers. It's a great starting point to understand how rapid-logging, note-taking, and signifiers can make your planning more efficient. Tasks are "actionable items" represented by a simple dot that can be used to signify what state a task is in: complete, migrated, or scheduled. This helps you keep track of your to-do list with very little effort. Events are date-related entries and are marked with an "O", which gets filled in when complete. Notes - facts, ideas, thoughts, and observations - are marked with a dash. Signifiers are symbols that represent and give context to your list; signifiers include asterisks to mark priority tasks, exclamation point for important tasks, or an eye to show something needs further research. It's important to remember that if something doesn't work for you, don't feel like you have to force yourself to use it. Over time you'll eventually develop your own key and signifiers. You might find colour-coding works better for you or a blend of signifiers and markers - experiment, try things out, find a method that works for you. The original bullet journal layout places a heavy focus on list making rather than calendar scheduling. If you're a visual person it's likely you'll want to add more elements, perhaps more colour, to your journal. The challenge is to create something that maintains the balance between organisation and design, style and productivity. The perfect bullet journal layout is very rarely perfected straight away; how you work will change over time and that's what makes this method of planning so unique. Don't try to be perfect, accept you'll probably make mistakes, smudge pages, spell things wrong, and errors will happen with your layout - it's all part of the learning process. If you find your layout isn't working, stop using it and switch up your method; that applies to everything from the template you use to the signifiers.